When in 1950 Frida Kahlo had to spend nine months in hospital after several spinal column operations, Rivera, who was having a very productive phase, took a room in the hospital and stayed there almost every night. While continuing with the frescoes in the National Palace he illustrated, together with Siqueiros, the limited edition of Pablo Neruda's great epic poem Canto General and designed its cover. 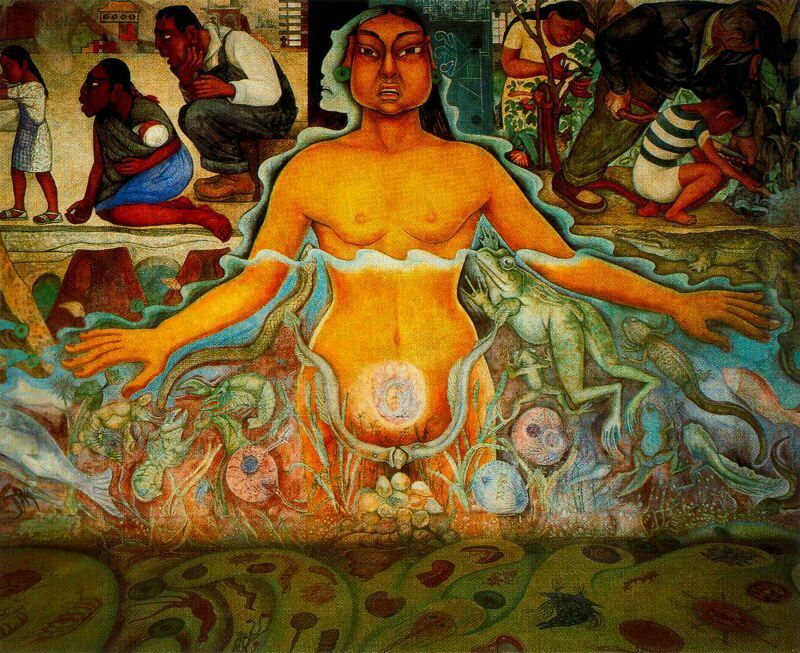 Early in 1951 Rivera received a new mural commission - the decoration of a waterworks scheme in Chapultepec Park, which would collect water from the Lerma as drinking water for Mexico City. The new type of construction of this distribution system was intended to conform not only to practical and technical but also to aesthetic standards, and set the artist a great challenge in the decoration of the cistern basin, its floor and walls, and a tunnel. 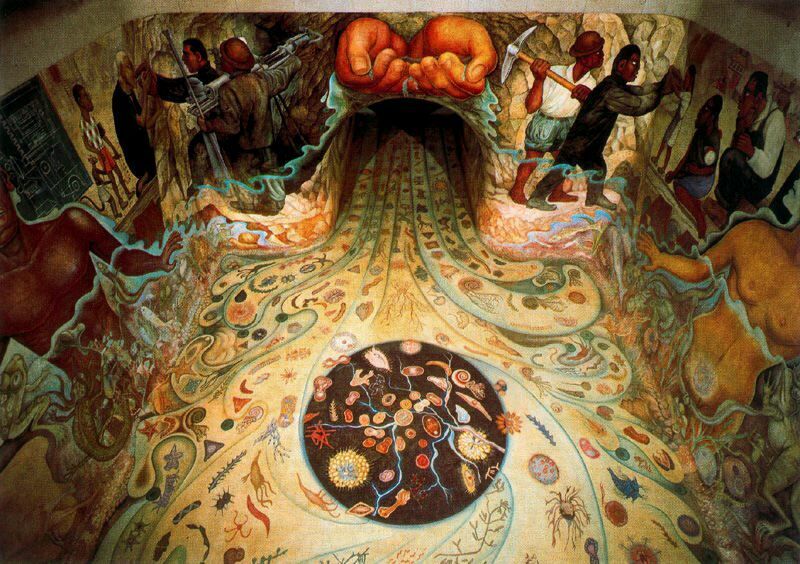 The mural Water, Origin of Life would for the most part be underwater, and so Rivera used an experimental technique with a combination of polystyrene and a rubber solution. The theme was homage to the life-creating power of water. In the well in front of the pumping station he executed the relief Tlaloc the Rain God, using a pre-Columbian mosaic technique with variegated stones. 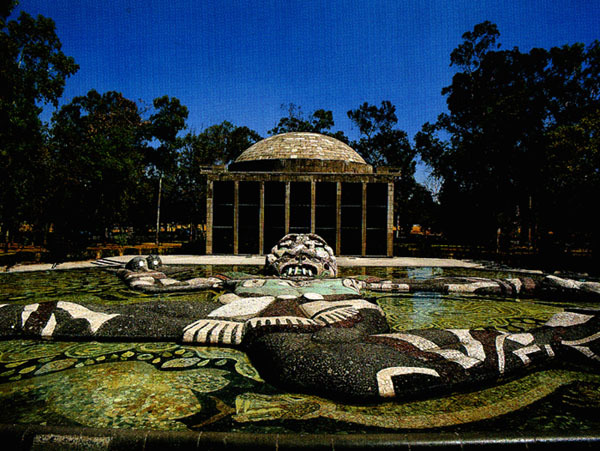 Rivera's work in stone mosaic, a technique that he had first adopted at "Anahuacalli" in 1944 then in Chapultepec Park, was continued in a project planned on a larger scale in 1951/52 but only executed in small part. The commission was for the decoration of the outer wall surface of the new Mexico University stadium, for which Rivera depicted the evolution of sport in Mexico from the pre-Columbian period to modern times and designed various motifs relating to sport in numerous preparatory drawings. Only the central part of the frontal piece of the whole design was actually executed in mosaic relief, the funding of the project being cancelled at this point. During President Miguel Aleman's term of office (1946-1950) Mexico openly turned towards Western capitalism, departing from the traditional Mexican line and moving towards cultural, economic and political modernization. 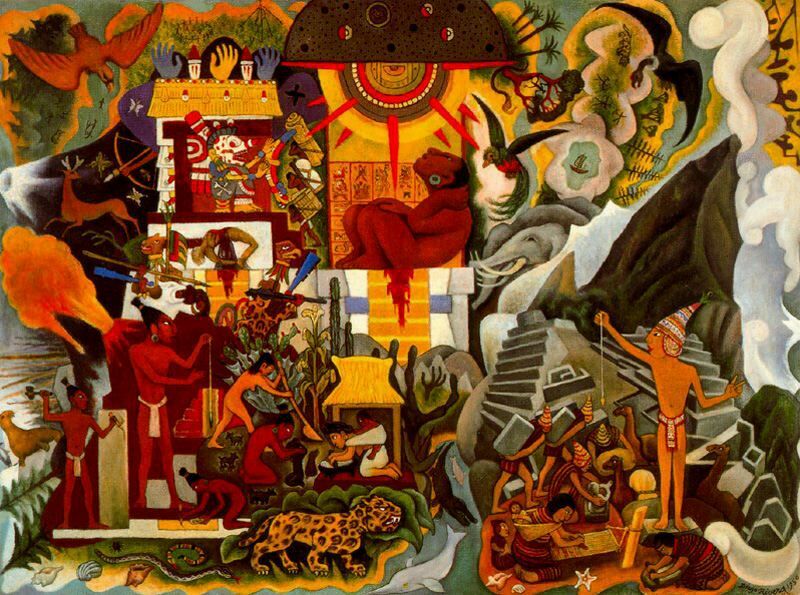 Despite this, Rivera continued to paint murals from an unequivocal Mexicanist viewpoint, as in History of the Theatre in Mexico on the facade of the Insurgent Theatre, where he symbolized the ideals of the Mexican Revolution. 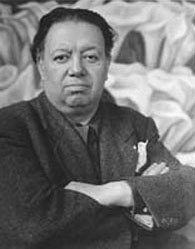 Even when in 1950 he was chosen with Siqueiros, Rufino Tamayo and Orozco to represent Mexico at the Venice Biennale, and was awarded the National Prize of Plastic Arts, the most important state prize, given annually to Mexico's foremost artists, Rivera did not renounce his opposition to state policy. 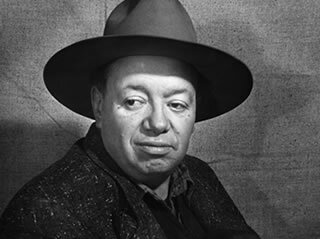 In 1946 he had applied for readmission to the Mexican Communist Party. His application was rejected, as was his later reapplication with Frida Kahlo. 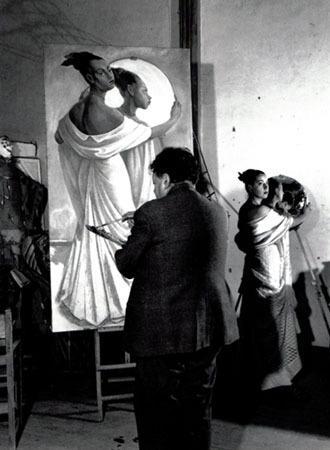 But while Kahlo was accepted in 1949, yet another application by Rivera was rejected in 1952. Early in July 1954 Rivera took part with Kahlo in a declaration of solidarity with the government of Jacobo Arbenz in Guatemala. Participation in a protest against the CIA's intervention in Mexican affairs was the last public appearance of Rivera's partner. Frida Kahlo died on 13 July at the age of 47. During the vigil over her body in the Palace of Fine Arts her political friends, with Rivera's agreement, spread the Communist flag over the coffin. In the sensation caused by this incident, Rivera's renewed petition for readmission to the Mexican Communist Party was successful. His first work after renewal of party membership was the large painting Glorious Victory, depicting the fall of Arbenz in poster style. Rivera sent this propaganda painting on tour to several countries of the Soviet bloc; it disappeared after the last showing in Poland. To this same year belongs the easel work The Painter's Studio, showing Rivera's work-room, with a model lying stretched out on an easy-chair surrounded by threatening-looking figures of Judas. This work's title indicates the increasing importance of the artist's studio as a workplace in these years. Not only his age but also the state of his health made work on monumental walls in the open more difficult for him, and so in his last years easel painting became his favoured medium. Since the end of the 1940s he had worked on commissioned portraits, and during this period their number increased. 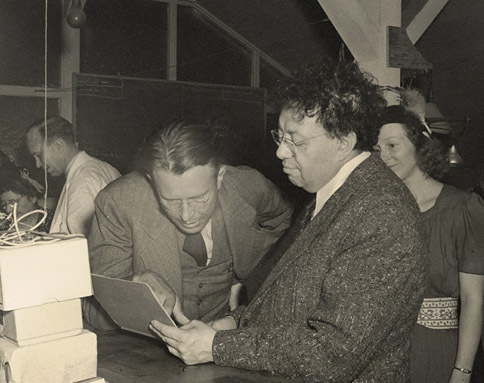 The fact that the artist so committed to Marxism attracted admirers even in distinguished society is surely one of the most surprising of all the contradictory facets of Rivera's life. 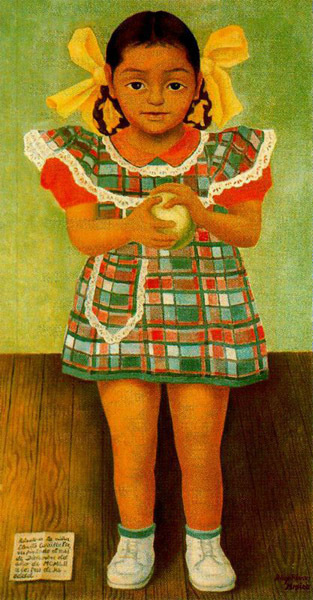 He was a favourite artist not only with American collectors who had been buying his portraits of Mexican children in Mexico ever since the late 1920s, but also, in the 1950s, above all with prosperous Mexicans, who commissioned portraits of their wives and children from him. These works are those of an artist who now painted "bourgeois pictures for the bourgeoisie", showing us "a kind of X-ray image of a new class at the very moment it was coming into existence, a class that acquired wealth through the onset of industrialization, and employed 'the Mexican' as a cosmetic element, a facial paint which was the exclusive fashion of filmstars, politicians' wives and a few intellectuals". Two typical such portraits are Sra. Dona Elena Flores de Carrillo, wife of the then rector of Mexico University, and her daughter Elenita Carrillo Flores. 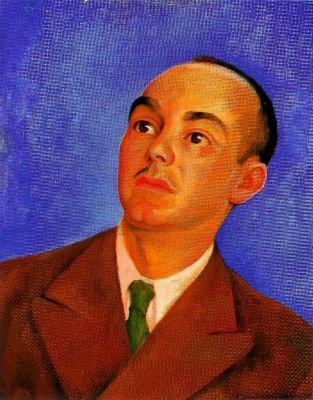 Almost all periods of Rivera's career include portraits. Besides numerous portrayals of historical figures in the murals, which served primarily political purposes, he began to paint portraits of persons close to him, friends and acquaintances, at a very early stage, during his years in Europe. In these works he sought to bring out the subjects' fundamental characteristics. Sometimes he emphasized certain parts of the body in an almost expressionist way, as in the extraordinary Portrait of Lupe Marin, depicting his former wife sitting in front of a mirror, a recurring motif in his portraits. 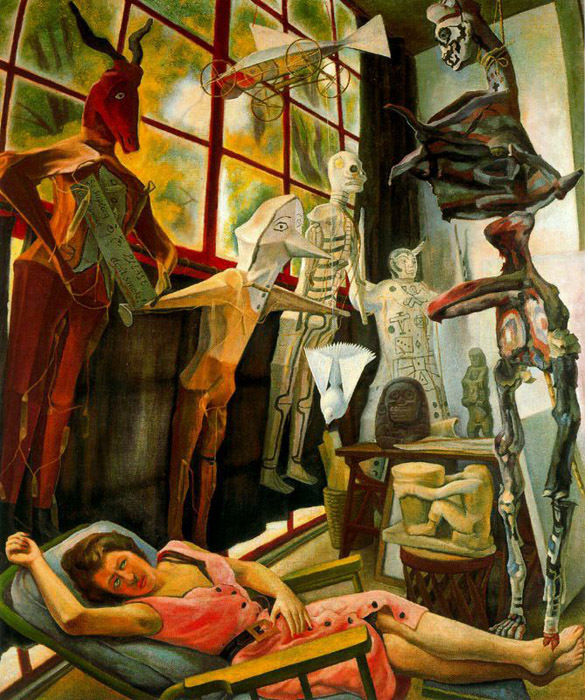 In this one the artist seems intentionally to refer to various artists of the past: in the exaggerated proportions and the very pose, to El Greco; in the mirrored reflection, to works by Velazquez, Ingres and Manet; while the complex structure of the composition, with its intersecting and linked planes and axes, points to Cezanne. 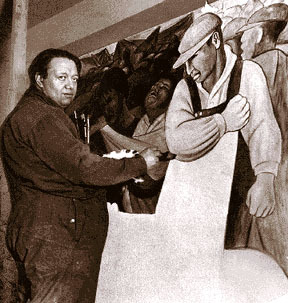 Having immortalized Lupe Marin and his daughters Guadalupe and Ruth in the gigantic historical mural in the Hotel del Prado, in 1949 Rivera painted the large-sized full-figure Portrait of Ruth Rivera. 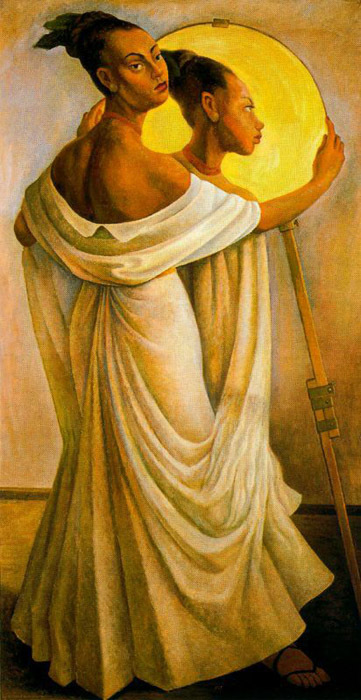 The subject stands in the manner of a figure from Classical Antiquity, wearing a white tunic and thonged sandals, in front of a round mirror which reflects her profile in brilliant yellow, strikingly resembling the Maya profiles seen in pre-Columbian sculpture and reliefs. 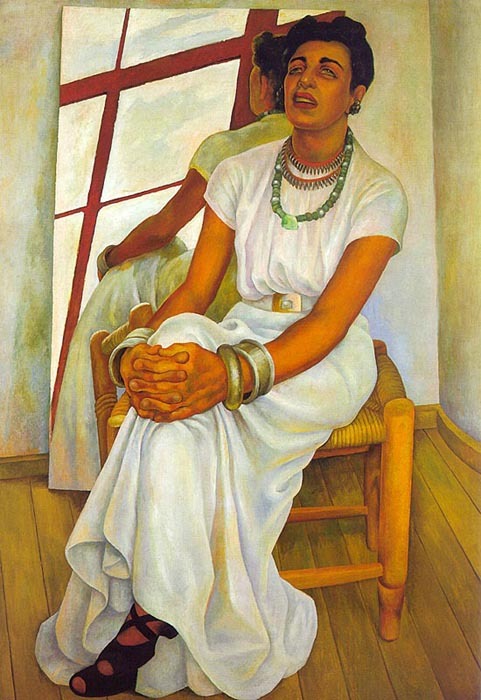 The mythological impact that this painting makes is in sharp contrast to most of Rivera's other female portraits where, as in Portrait of Cuca Bustamante (1946), the subject is frequently shown in brightly coloured Mexican costume or there is a heightened Mexican ambience with exotic flowers and fruit. 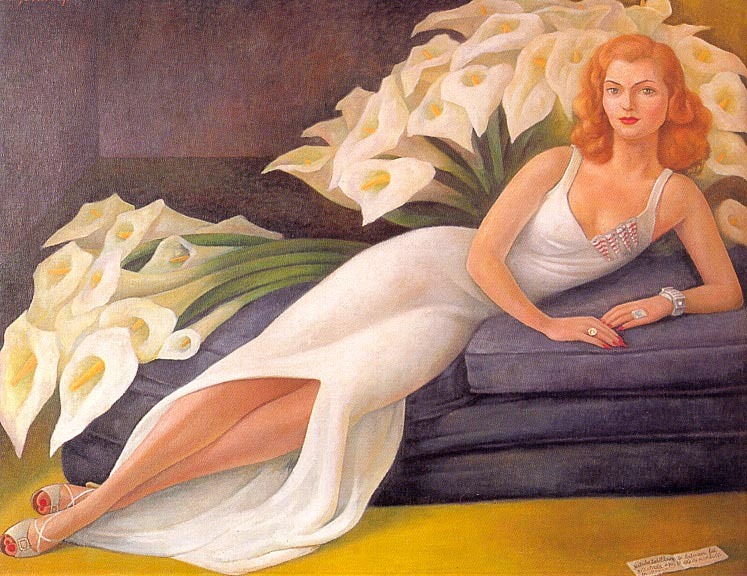 In paintings of the latter category, parallels are often drawn between background attributes and the women portrayed: the pose and the white, close-fitting evening dress of Natasha Gelman, for example, wife of a famous and prosperous film-producer, take up the elegant form of the calla lilies providing the prominent background, which at the same time symbolize the nature of the fine woman. The figure of Machila Armida, a good friend of Kahlo and Rivera, said to have conducted a number of light-hearted affairs, is portrayed in Macuilxochitl as a machila flower in a "testimonial of love", as the inscription in the picture has it, and surrounded with exotic fruits and flowers. She herself becomes a part of this splendour, for the colours of her green dress, red mantilla and pink skin, reminiscent of the paintings of Renoir, are identical with those of the flowers and fruit. In these works Rivera refrains from his penchant for historical narrative and reveals himself as an extremely sensual painter, letting his feelings and fantasies flow freely into his compositions. 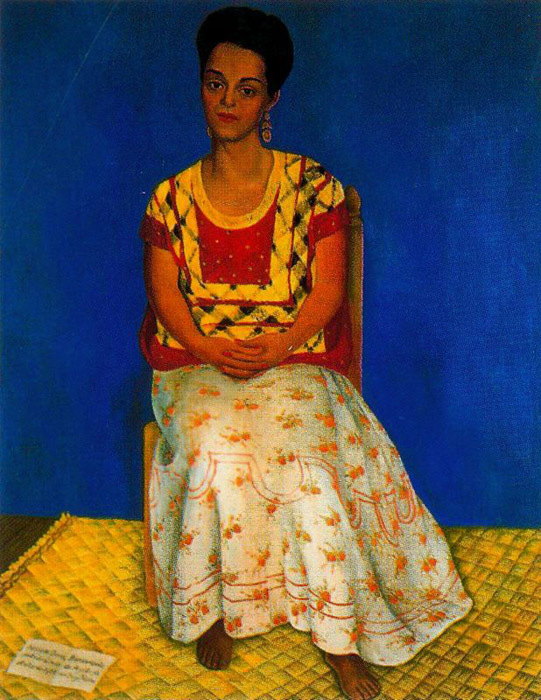 Shortly after he was found to have cancer, on 29 July 1955 Rivera married the publisher Emma Hurtado. To her in 1946 he had ascribed the rights in all his paintings and drawings that were not the property of a client, for display in the Diego Gallery which she had opened for the purpose of selling his work. With his new wife he made a trip to the Soviet Union later in 1955 to undergo an operation and cobalt treatment; he had a great belief in Soviet medical achievements and hoped for a cure of his cancer. On his return journey he visited Czechoslovakia, Poland and East Germany, becoming a corresponding member of the Academy of Arts in Berlin. Some of the drawings he made on this trip were later used in oil paintings, among them Ice Lingering on the Danube at Bratislava (1956). Whether May Day Procession in Moscow was the original title for another oil painting dating from this period, however, is questionable. Rivera returned to Mexico at the beginning of April and so did not again attend the Moscow May Day celebrations. 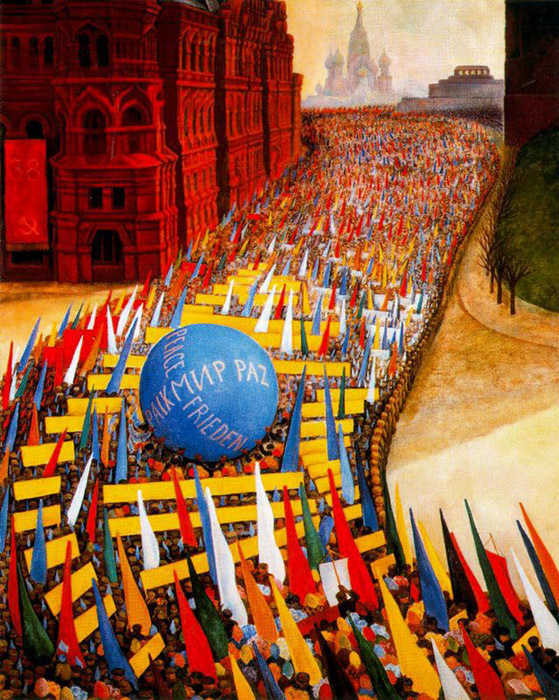 The colourful procession depicted in this work is more likely to have been a peace rally in these years of the Cold War, and the giant blue balloon which is carried by the demonstrators, displaying the word "peace" in various languages, would seem an indication of this. In its entire composition and palette, it is a thoroughly optimistic picture, and seems to express Rivera's own mood after receiving cancer treatment in the Soviet Union, an awareness of life that also enters a number of drawings of doves of peace belonging to this year. The artist appears to sense that his life is approaching its end, and feels a need to make peace with the world. 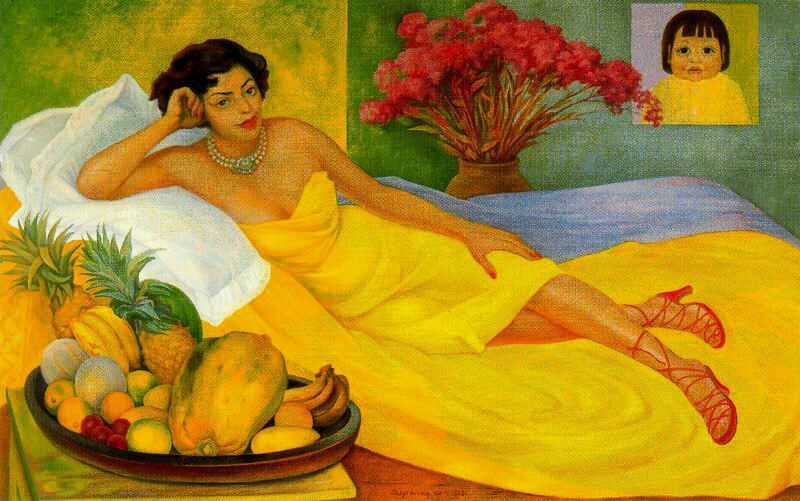 On Rivera's return to Mexico, Dolores Olmedo, a good friend, placed her house in Acapulco on the Pacific coast at his disposal, and here he spent the next few months in recuperation. 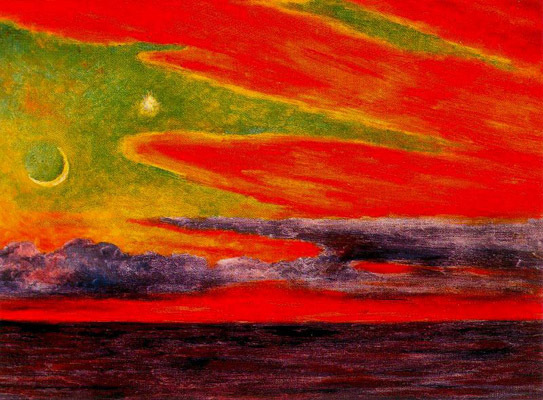 Besides some mosaic decorations in stone with pre-Columbian themes for his hostess's house, he painted a large number of sunsets - small-size oils in extraordinary colours, views from the terrace onto Acapulco Bay (ill. p.91). In these almost miniature-like works too, the emphasis is on peace, on the artist's love for life, nature and his country, his need for harmony and tranquillity. After his return to the capital Emma Hurtado exhibited these new works in her gallery in what, together with a show in honour of his seventieth birthday, was his last exhibition. Rivera spent the birthday itself quietly with family and close friends. The writer Efrafn Huerta, who accompanied him on that day on a visit to his birthplace. Guanajuato, wrote later: "Diego wept, and there was a scarcely discernible trembling of the lips. We were in Guanajuato, opposite the house where he was born seventy years ago. And since then I have felt admiration for men who can weep. Twenty years ago I saw him run the length of Cuba Street chasing a fascist after a very stormy meeting in Santo Domingo Square. And since then I've known that he is a brave and worthy man. Digno [Worthy] Rivera, he ought to be called. Or an M between his names would make a perfect name for him: Digno Mexicano Rivera [Worthy Mexican Rivera]." 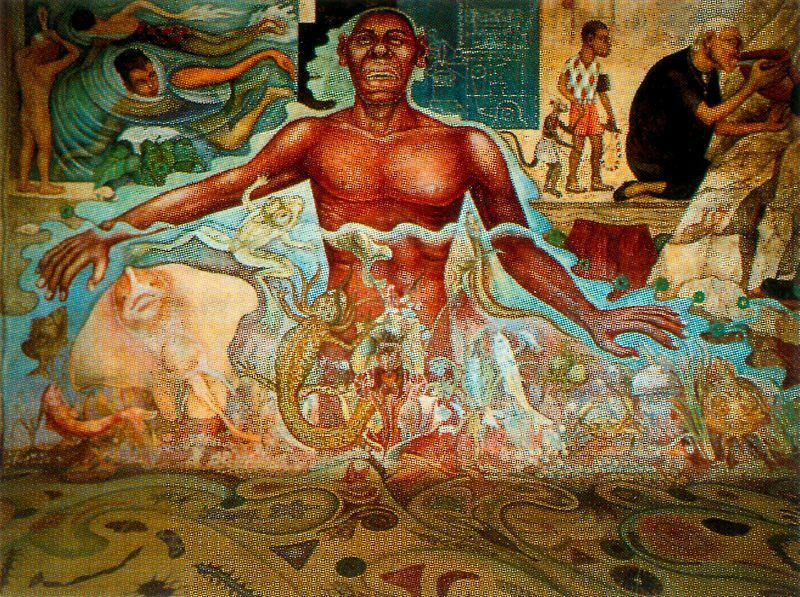 On 24 November 1957 Rivera died of a heart infarct, in his studio at San Angel Inn. Hundreds of Mexicans attended his funeral, as they had Frida Kahlo's. The terms of his will were not observed. He was buried in the Rotunda of Famous Men (Rotonda de los Hombres Ilustres) in the Civil Pantheon of Mourning (Panteon Civil de Dolores); his ashes were not mingled with those of Frida Kahlo in the "Blue House" which, like the building and collection at "Anahuacalli", he had bequeathed one year after his wife's death to the Mexican people as a museum. The writer Carlos Pellicer, a friend of his since 1922, had taken on the task of turning the two houses and their collections into museums. In the course of time Rivera's work came to be seen as inseparably linked with Socialist Realism, and it must be conceded that his political standpoint and the themes of his murals would seem to support this. 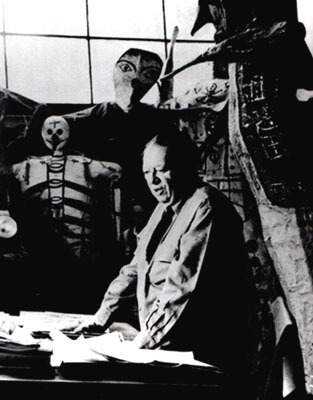 The style of his mural work, however, and indeed, his whole aesthetic, founded on his studies of Italian Renaissance frescoes, classical proportion, pre-Columbian sculptural forms, Cubist handling of space and Futurist representation of movement, ultimately have little in common with Socialist Realism. His work contains not only observation of social circumstance but also complex allegorical and historical narrative. Consideration of his oeuvre as a whole clearly indicates that, out of the many different techniques he mastered. Rivera evolved his own completely individual style. His view of the world, of the humanistic role that he saw for the artist and art in society, were intuitive above all. and produced a universal art that still retains its force today.